When I contacted Bluebird Lane looking for a Fjord Horse, I told Lori that I was interested in a high-end, show-quality, young gelding that could be used in English Pleasure, Dressage and Pleasure driving competitions. Beautiful movement and conformation in a prospect were top priorities for me. I wanted a horse that would be a steady trail horse as well. Jaeger has all those qualities and much more. He is talented, hard-working, gentle, smart and incredibly handsome! Lori listened to what I was looking for and found the perfect horse for me. 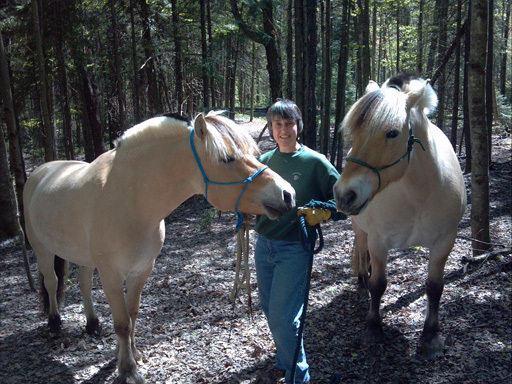 Lori understands Norwegian Fjord Horses and breeds the best! Lori was and is absolutely amazing to deal with. I contacted her via email. She was prompt, kind and professional in getting back to me. I had never had such a great experience buying a horse before, and I have bought quite a few in my time! Lori matched my extensive wish list with a beautiful gelding by the name of Bluebird Lane Tyvjo, who we now lovingly refer to as Blue. He has amazing bloodlines, beautiful conformation and a personality to melt for. Blue is so laid-back that with my busy schedule I can go days to weeks without working with him and when I start up again it is like we had never stopped our schooling in the first place. He is also very calm and patient around my children. I simply cannot say enough good about him! If you are looking for a calm, versatile horse then definitely go Fjord and if you are looking for friendly, knowledgeable people to deal with then go to Bluebird Lane! I bought Bocina, a 9 year old mare, from Lori Albrough. I had been aware of Lori’s work through her website, Fjord discussion groups and her reputation. 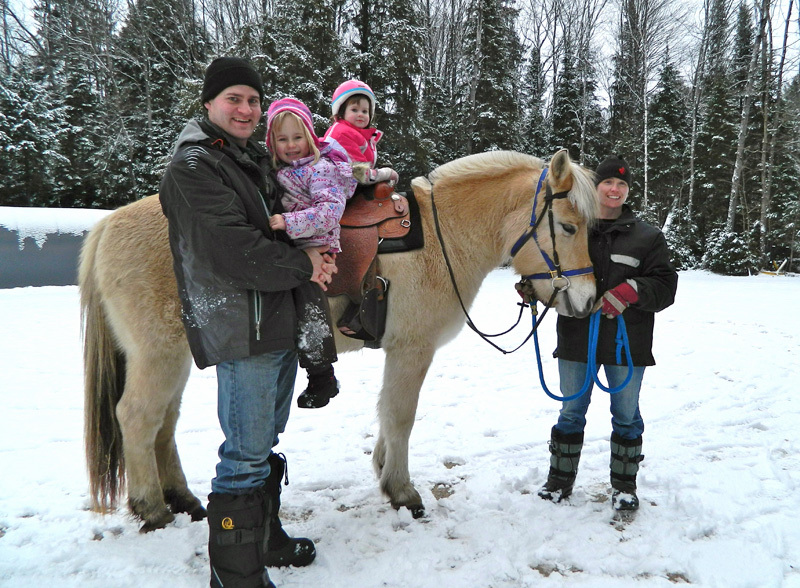 Getting a horse had been a lifelong dream, postponed through decades of financial uncertainty, work, travel and raising children. In the 1980s I discovered Fjords, and was hooked on the breed. I had not intended to purchase a horse until settled on a rural property, but Bocina jumped out as very special, and my conversations with knowledgeable “Fjord people” convinced me my intuition was solid. It was obvious from my initial contact with Lori that she was a very dedicated, open and ethical breeder/trainer/owner. I was able to visit Bluebird Lane and watch the way in which she and Stefan and their barn manager looked after the horses. There was a well-organized professional yet loving calmness about all aspects of this work. We all see vast amounts of ad copy in our lives, and the write up for Bocina was almost too good to be true. As one unlikely example: “In a breed of horses known for being ‘sweet and gentle’, Bocina takes it to the next level, with the aura of a Zen Buddhist monk.” Well, there was nothing in the write up that wasn’t true! 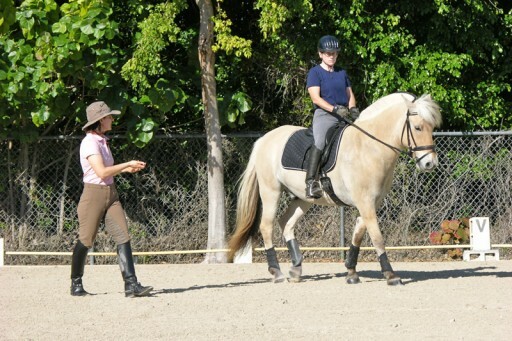 Lori seems to bring out the strengths in every horse, and works to nudge away any problems. Every horse in the barn was unique and she was working with each of them to create living, breathing, trusting works of art. I realize this note makes Lori and Bluebird Lane Fjords and Bocina sound too good to be true, but over the last few months I have been consistently amazed, even though I already knew I’d connected with one of the great Fjord farms. Thank you Lori and Stefan for all your help and guidance through this process. You were, and are, so responsive to my never-ending inquiries and questions, even before I knew I would actually be buying a new horse. I appreciate how you strive to be up front with everything, especially as regards the horses’ abilities and personalities, because a sensible and steady temperament is on the top of my must have list for any horse I own. I am not always the most confident person, and it was very important I find one that I can be comfortable working with and who I think will be generous and not over-reactive through whatever mistakes I might make along the way. Storjo is extremely personable, always seeking out attention and coming over to find out what is going on and to see if he can “help”. I think he will make a great all-arounder and I look forward to this journey with him in years to come. Lucky me to now have not one, but TWO wonderful Fjords!! I have known Lori for a number of years, taken lessons from her and observed her training various different horses on a number of occasions. I have the utmost respect for her skill as a trainer and rider. Lori’s calm, confident manner instills confidence in the horses that she is training. I have never seen her ruffled or lose her temper, no matter what a horse does. Her corrections are applied and timed appropriately, therefore the horse really understands what is expected. She trains horses to be forward and obedient, as well as sensitive to the aids. She also understands that horses are individuals and not all horses respond to exactly the same technique. What is not enough for one horse may be too much for another, therefore she adjusts her approach accordingly. I highly recommend Lori as a trainer particularly for the dressage horse and the Fjord breed since she has special expertise in both of those areas. I also think as a seller of horses that Lori is honest in her assessments of her own sale and consignment horses, which is fairly rare in my experience. I have sent horses to her for training and would not hesitate to do so again or to look at a horse she had for sale. I purchased Bluebird Lane Peregrine last May. What a joy to ride! I’ve never had such a smooth, relaxed ride in all three gaits. It’s like sitting in a comfy rocking chair. Peri is so sweet and calm. I love her quiet nickers. I mainly ride her on trails as I don’t show. I love her deeply. She is well cared for and will be with me to the end of her time. Thank you Lori, for breeding Fjords of exceptional qualities in all areas: temperament, willingness, beauty, intelligence and companion exceptional. 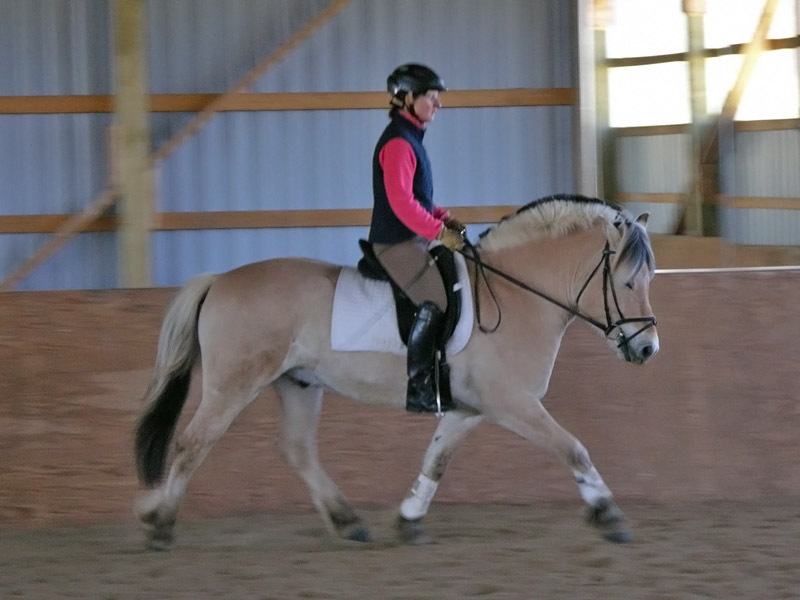 I initially contacted Lori because I had become interested in the Fjord breed as a possible alternative to the warmbloods as something I could enjoy for recreation and sport. Although I had bred and ridden warmbloods for a number of years, I felt that as I had become older (and less brave) I might feel safer on a smaller, quieter horse. Lori and her horses were especially interesting to me because she was doing dressage with her horses and was having a lot of success. I had done some dressage and wanted to do more. I ended up buying a handsome and smart young gelding called Einar from Lori, and left him with Lori to start under saddle which she did in a logical, progressive manner. After a couple months Lori helped me have my first rides on Einar and I was not disappointed! She was a patient teacher and we did a number of lessons together before I took him home. My regular dressage coach took over from there and was so impressed with Einar’s trainability and the “big horse” feel he gives when you ride him. Lori has been kind, honest and professional in all respects and Einar has been wonderful — affectionate, athletic and willing to please. Thank you Lori, for the many hours of excellent training which you provided for our horses. We appreciate your common sense approach and the way you adapt your program to fit each horse’s abilities, realizing that even though they are all Fjords each is unique and special in his or her own way. Thanks to you, the girls now have the training we wanted for them! And thank you for providing such wonderful care for our horses! You’ve been generous with your time — measuring for halters and bridles, looking at saddles, making videos and, of course, Stefan’s expert mane trimming. You’ve been generous, too, with your advice and we’ve learned a lot. As Jim said, you’ve always gone the extra mile. 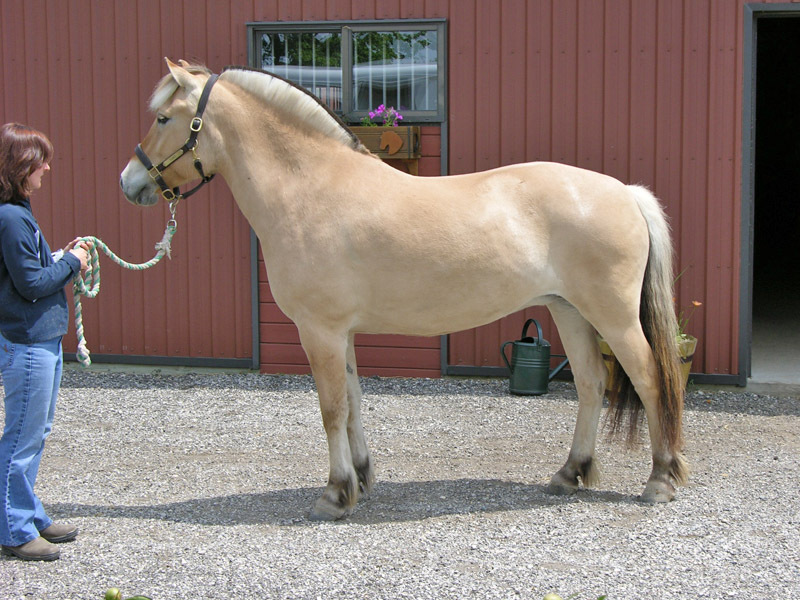 I had been searching for a Fjord mare for some time, and I was beginning to feel as if my expectations/goals for my dream mare were just too high. I had visited some lovely farms, looked at quality Fjords, and talked to some well-educated breeders, but still I just couldn’t seem to find the “right” combination in any horse. That’s when I was referred to Lori Albrough, and her Bluebird Lane Fjords. After looking at her website, talking with her, and looking at her horses’ pedigrees, I decided to persuade my husband that I needed to travel to Ontario, Canada to find a horse. This was not an easy feat, as he is as non-horsey as you can get, and he doesn’t have my love for the animals. Upon arrival things were wonderful. Lori and her husband Stefan were very welcoming, and the farm and animals were obviously very well cared for. Lori showed us two mares that she had for sale at the time. We discussed the temperament of each animal, and how they might fit into my expectations and goals. Each mare had an excellent pedigree, and both were very different, both physically and mentally. They were at different places in their training but they were both wonderfully mannered and handled beautifully under saddle. Lori is a very good listener and she knows her horses very well. I valued her opinion in terms of which horse would work the best for me in terms of my different goals. She definitely wants the best for her horses and the people who purchase them. She wants to make sure that it’s a “fit”. 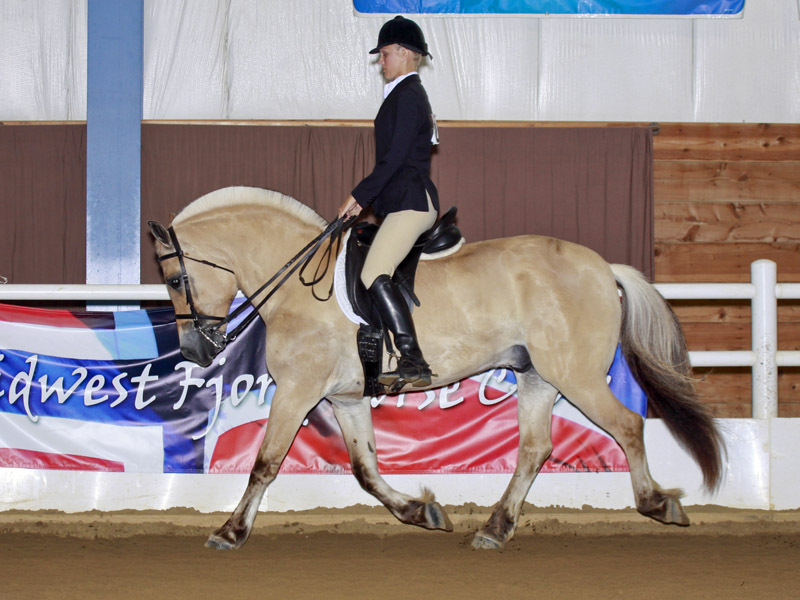 Lori puts much time and effort into the starting and working of her Fjords and it shows in their ground manners, their performance under saddle, and their overall behavior. They were happy in mind and very willing to please. As our visit came to an end and my husband and I prepared to leave he turned to me (and I was beaming from ear to ear from the wonderful experience of riding two well-trained Fjords) and he said “Wat’cha gonna do?” I, not wanting to push him, said “What do you think I should do?” To my complete amazement he replied, “You’d be an idiot not to take both.” I not only had to pick my jaw off the floor, but my whole body off the gravel driveway. But you see, he had made several trips with me in my search for a mare, and he had watched me with the horses, so he was able to see the clear difference in the combination that was represented in Lori’s horses. Lori combines quality horses with quality training. Who could ask for more? My search was done, and I soon had two lovely mares in my barn. I would definitely refer anyone (in any equine discipline) to Lori and Bluebird Lane Fjords. They most certainly will find happy minded, well- mannered, trained Fjords there, and their search may well end like mine — with a big YIPPEE! After an exhaustive search, with enough research material to fill a four inch binder, I found the mare I was looking for at Lori Albrough’s Bluebird Lane Farm. She was exactly as represented and was the highest quality Fjord mare with the best foundation and training available anywhere. 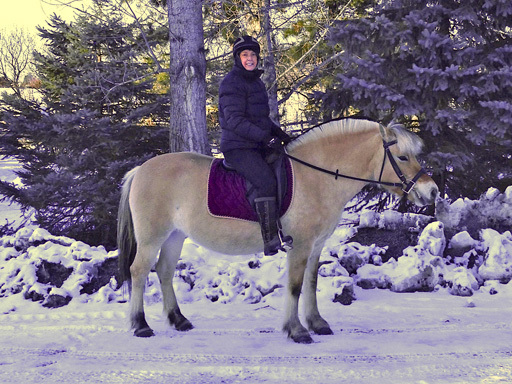 As an experienced horseman, but new Fjord owner, I appreciated Lori’s expertise and professionalism. I purchased the horse sight-unseen based on photos, a comprehensive video and Lori’s honest evaluation of the mare. I was delighted to find her just as represented when I arrived in Canada to pick her up. I recommend Lori’s ability to find the right horse for the right owner. It certainly worked for me! I spent years competing in numerous equine disciplines and form-to-function was very important to me when looking for my next competition horse. Lori’s breeding program is geared towards producing Norwegian fjords that are athletic with good temperaments while still ensuring Norwegian Fjord type comes first and foremost. I purchased Bluebird Lane Myrrikse as a two year old. When Myrrikse arrived it was very apparent that her handling before coming to me had been done right. She was very respectful but not intimidated or afraid of me or her surroundings. She has a very sweet, kind, curious disposition. She is a forward moving equine that is sensitive to touch and very willing to learn. She puts her whole heart into everything asked of her. I call her a big horse in a little body as she will always give you her all without complaint. I had Myrrikse evaluated in 2010 and she had the highest score at that evaluation. Her conformation scores were as follows: Head: 9, Neck: 8.75, Body: 8.5, Forelegs: 7.5, Hindlegs: 8, Walk: 8, Trot: 8.5, Overall impression: 8.5, Breed Type: 8.5, 84 total score. Myrrikse is the best mountain horse I have ever ridden and I just love going up against the big horses in these settings as they don’t have a chance against a horse like her. This year Myrrikse and I are starting dressage training as she already has all the basics and is extremely responsive to leg yields and to a soft hand. This makes her training a lot easier as you do not have to worry about impulsion, yielding to the bit, up and down transitions, or lateral movements as she is extremely athletic, intelligent and responsive to training. She is very sensitive to pressure which makes it easier when training her to come into your hands and not lean on the bit or try taking control of the bit on you. If you are looking for a really good Norwegian Fjord for any discipline then I would highly recommend that you go see Lori. She knows what she is doing and she takes her breeding program very seriously.